Knee pain can heavily impact your daily life and stop you from doing sports, working or moving around freely. That’s why at The Foot Clinic, we focus on helping you with an accurate diagnosis, and a treatment plan focused on reducing pain and getting you back to normal. There are a few good reasons to see your podiatrist when you experience knee pain. The most important one: in the human body, everything is connected, and a problem in your knees may be caused by a foot condition. When you walk, ideally all muscles, bones, joints and ligaments are positioned correctly and don’t experience excessive strain. But when you use inappropriate footwear, certain areas of your foot may not receive the right support. When you walk, the shock absorbed by your knees can be too big and this is what can cause a typical overuse injury. Osgood Schlatter or Osgood Schlatter’s Disease, is a big word for painful knees in adolescents. When a teenager goes through a growth spurt, the tendons around the knee become tighter and create strain on the growing bone. Naboso Proprioceptive Insoles are textured insoles which improve proprioceptive and neuromuscular stimulation to the skin of the feet. Their function is very different to a standard orthotic which provides physical bio-mechanical support/control to the foot and leg. If you have flat feet, then this can cause your feet to be positioned in a less-than-ideal way. And poor positioning of your feet can put unnecessary pressure on your entire leg, also causing knee pain. With flat feet, your lower leg rotates in one direction, and your upper leg rotates in the opposite direction. This is what causes twisting forces in your knee and triggers the knee pain. Foot pronation is all about how your feet hit the ground, and how they absorb the shocks. 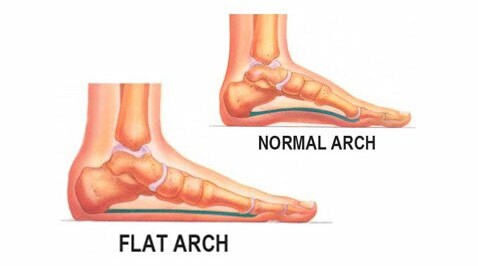 Ideally, your feet roll inwards and this makes the arch of your feet carry your body weight (on average, in this ideal situation, it supports three times your body weight). Overpronation means that your lower leg rotates inwards, and this places extra force on your knee. In this case, your knee pain is a result of excessive rubbing and strain on your knee joint, and even your hip can become misaligned. Eventually, the position of your feet can create a chain of other conditions, all the way up to problems in your lower back. This is why it is essential to have your knee pain correctly diagnosed by your podiatrist at The Foot Clinic. Knee pain can be linked to an inflammation right below the kneecap, especially in teenagers. Osgood Schlatter’s disease is an inflammation of the growth plate of the lower leg bone. Knee pain can be linked to how you use your feet. This is why, at The Foot Clinic, we will always look at the bigger picture and will use a bio-mechanical assessment, to inspect the way your feet influence your knees. If your feet roll in or roll out too much, they cause increased stress on your knees and that may be linked to the knee pain you experience. This is where our biomechanical assessment will give you more information on the exact causes of your knee pain. This is always the starting point, to recommend the right treatment options. Knee pain can be treated in a variety of ways. 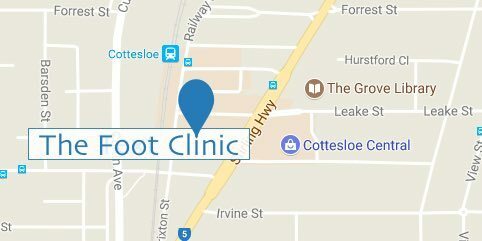 Once we have created more clarity on what causes it, our recommended treatment option at The Foot Clinic may consist of exercises and stretches, as well as orthotics and advice for footwear. This can all improve the position of your feet, and reduce the pressure and stress on your knees.